Junk Cleaner is the PUP that uses misleading techniques to prevent removal. Use Reimage to locate malicious components and get rid of them faster than with uninstall instructions. A full system scan blocks virus reappearance and prevents traffic to malicious domains. Junk Cleaner is a questionable program that promises to optimize computer’s speed and performance. However, a free version of the program works like a scanner, and this feature might be misleading too. It is created to promote the paid version of the program by delivering fake error messages and exaggerated system scan results. encouraging users to buy a license key. Once installed, it launches the scanner, initiates a full system scan, and delivers scan results with the list of detected junk files. However, this program works in a deceptive way to swindle away money from gullible people because in order to remove junk you will be asked to pay a considerable amount of money for a premium version of Junk Cleaner virus. The program also offers to call a toll-free number 1-866-606-9133 if users need any help. However, in order to get help, you will be asked to pay a particular amount of money. However, paying for unknown services may not help to get needed assistance. People who are waiting for your call 24/7 just want to trick you into purchasing the license. We highly DO NOT recommend buying it since this optimization tool is capable of detecting only a small part of bad registries and junk files, which removal will NOT improve your PC's performance. By the way, think twice before giving away your money for suspicious third parties because you may unconsciously reveal your credit card details to cyber criminals. In case Junk Cleaner redirects to the official website have already started disrupting your online activities, make sure that you remove this potentially unwanted program from your computer without any delay. The most reliable way to remove Junk Cleaner is to run a full system scan with a decent anti-malware, such as Reimage. Using security software is especially recommended if this program appeared out of nowhere and started bothering you with suspicious system scans. You can also find manual Junk Cleaner removal guidelines at the end of the article. 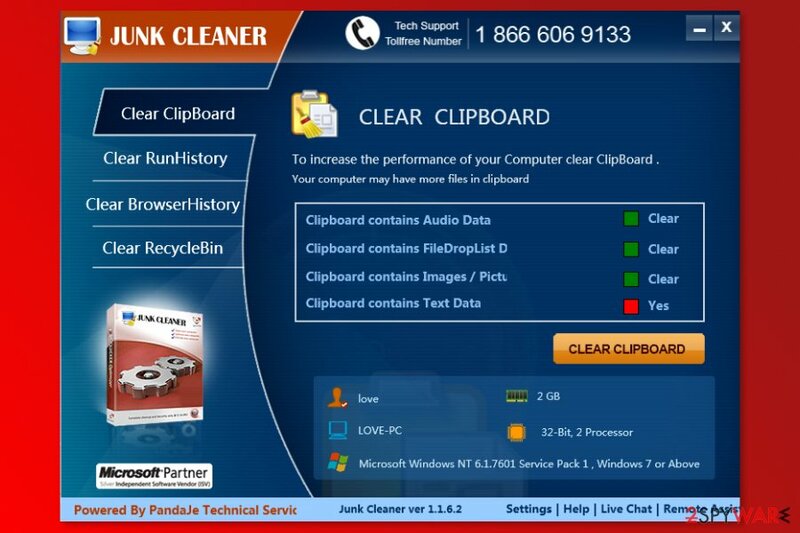 Junk Cleaner is questionable PC optimization software that only promotes paid version of the program. It has been found spreading via software bundles as an “optional download.” Fortunately, it's possible to decompose software packages and end up only with the freeware that you want to install. However, in order to check which freeware carries attachments you have to pay close attention to the entire installation process. Select Advanced or Custom installation option and look for the check boxes promoting 'optional downloads' and carrying them by default. Of course, the freeware that you opt for installing may not be filled with potentially unwanted applications. However, the chances to download a bundled software are the same. Check every freeware and unmark Junk Cleaner, ViewPassword, FlashFree, Slick Savings, and other suspicious apps. Fortunately, we haven't received many reports about that and cannot confirm that such activity is caused by Junk Cleaner virus. However, we want to warn you that it's possible. Here, look for Junk Cleaner. Uninstall it and other questionable programs. For automatic Junk Cleaner removal, we recommend using Reimage, Malwarebytes MalwarebytesCombo Cleaner or Plumbytes Anti-MalwareMalwarebytes Malwarebytes. ^ Chris Hoffman. PUPs Explained: What is a “Potentially Unwanted Program”?. How-to Geek. 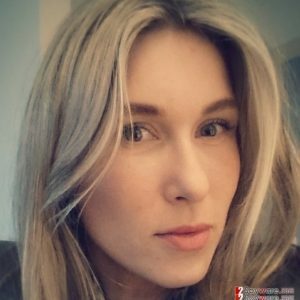 Technology-related website and tutorials. ^ Louise Cheer. Revealed: How criminals get the 'CVV' security code on the back of your credit card - and how to make sure you don't get skimmed. Daily Mail Online. News website. ^ Margaret Rouse. Antimalware (anti-malware). TechTarget. The network of technology-related blogs. This entry was posted on 2017-09-29 at 02:44 and is filed under System tools, Viruses. You can quickly scan the QR code with your mobile device and have Junk Cleaner manual removal instructions right in your pocket. How did you remove Junk Cleaner?